The Resurrection of Jesus Christ from the dead is the center of the Christian faith. St Paul says that if Christ is not raised from the dead, then our preaching and faith are in vain (I Cor. 15:14). Indeed, without the Resurrection there would be no Christian preaching or faith. The disciples of Christ would have remained the broken and hopeless band which the Gospel of John describes as being in hiding behind locked doors for fear of the Jews. They went nowhere and preached nothing until they met the risen Christ, the doors being shut (John 20: 19). Then they touched the wounds of the nails and the spear; they ate and drank with Him. The Resurrection became the basis of everything they said and did (Acts 2-4): “. . . for a spirit has not flesh and bones as you see that I have” (Luke 24:39). In His Death and Resurrection, Christ defeats the last enemy, death, and thereby fulfills the mandate of His Father to subject all things under His feet (I Cor. 15:24- 26). Frequently, the icon of Christ’s Resurrection, depicts Jesus descending into Hell, breaking the bonds of death and raising up Adam and Eve, surrounded by all the righteous who were held captive in Hades (1 Peter 3:19). In this icon of the Resurrection, Christ is depicted triumphantly victorious over death standing at the entrance of the empty tomb (Mark 16: 9-13). 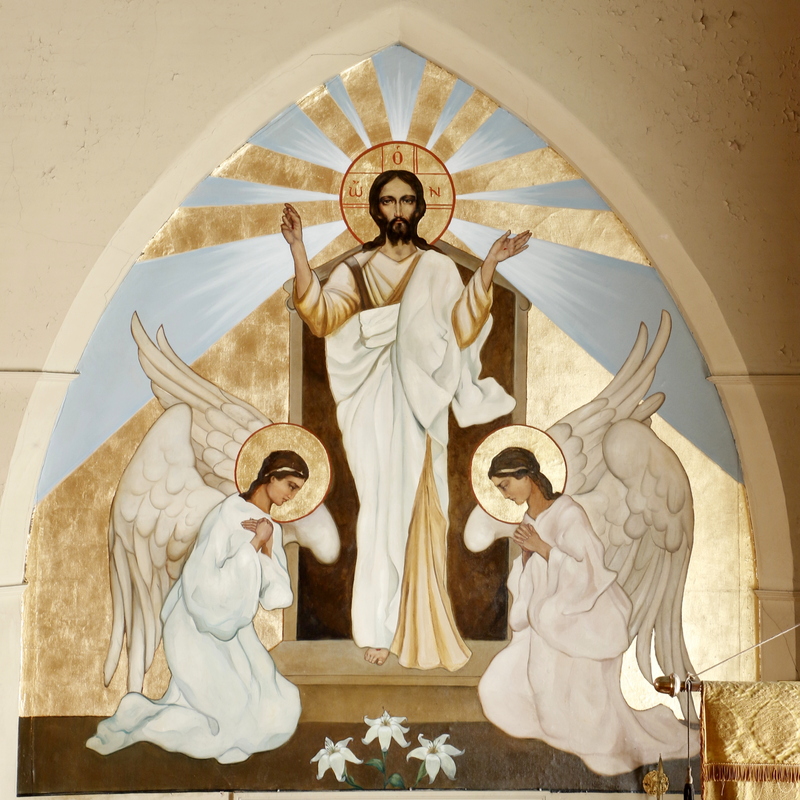 In front of Christ are two angels bowing in worship to the Risen Christ (Luke 24: 4-6).